The market reacted rather favorably when Wabash National (NYSE:WNC) released its earnings and updated guidance for 2017. Much of that optimism can be attributed to management's efforts over the past several years to transform Wabash from a cyclical manufacturer of a low margin product to a diversified manufacturer of transportation products that can handle the ups and downs of the market. Let's take a look at Wabash's most recent results to see why this past quarter was another step in the right direction as well as what investors can expect from Wabash in the coming quarters. *in millions, except per-share data. Source: Wabash National earnings release. Like all earnings releases, there are some good and bad points worth hashing over. One thing that stands out as less than desirable is the decline in sales in the past quarter. This was expected, though, as management's guidance for 2017 was 51,000-55,000 trailers shipped in 2017 -- down from 2016's total sales of 58,850 trailers. In fact, sales for the quarter were better than expected as management was able to raise its trailer shipment guidance to 52,000-56,000 for the year. One thing that is worth celebrating is that the company appears on track to meet its product diversification goal. A few years back, Wabash put a strategic plan out to 2020 to improve profitability and returns on invested capital across the business. One way it chose to do that was to diversify its product offerings. In 2005, 77% of its revenue came from dry van trailer sales -- these trailers are the ones towed by 18-wheelers you see on the road. In 2016 that number had declined to 64%. These diversified product offerings have higher margins and have helped drive bottom line results over the past few years. Non-dry van trailer sales for the first quarter were a little weaker than expected. Management mostly attributed that to "softness" in the chemical and energy segments. It's true that the chemical manufacturing and energy industries haven't been knocking it out of the park as of late, but they are certainly two segments doing much better than a year ago. It will be worth watching to see if its non-dry van sales continue to struggle as these two industries are on the mend. One thing that stands out is Wabash's free cash flow for the quarter, which was up 60% despite earnings declining. A large part of that was because of a $32 million drawdown of working capital. That said, free cash flow even after adjusting for the working capital changes was enough to pay dividends and buy back stock. Management expects it will be able to keep its dividends and buybacks going for a while now that it has drastically reduced its total debt load over the past few years. 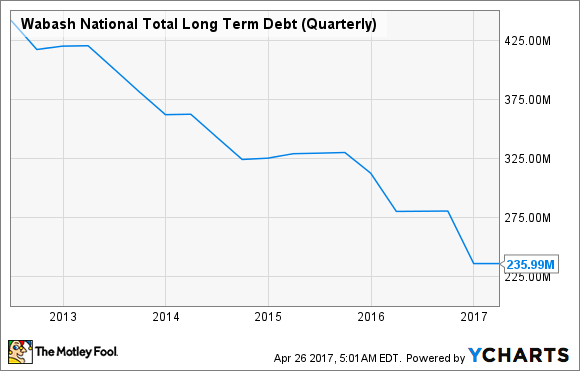 WNC Total Long Term Debt (Quarterly) data by YCharts. Performance targets in cost management and execution were achieved within both Commercial Trailer Products and Diversified Products, as gross margins delivered were consistent with expectations previously communicated, despite trailer shipments slightly below prior guidance due strictly to timing of customer pick-up. Backlog grew once again, coming in at a seasonally and historically strong $863 million, continuing to support our long-standing belief that trailer fleet age, regulatory compliance requirements, and customer profitability provide strong support for a continued favorable demand environment. Additionally, we remain focused on driving further productivity improvements throughout the business, optimizing the cost structure and performance of our Diversified Products segment, and developing growth opportunities through new product and market expansion efforts. Manufacturing tractor trailers and other trucking-related products is very much a cyclical business. The past year or two have been some of the better years as customers have had to replace aging fleets of trailers and make up for underinvestments from the financial crisis. Based on the decline in orders as of late, it would appear that we are either at the top of the cycle or are headed back down again. Luckily for Wabash National investors, the company has diversified its product offerings, improved operating margins, and strengthened its balance sheet since the last downturn. These should help it weather a market downturn if we are indeed headed that way, or it could mean Wabash is poised to generate strong results as the market plateaus. Either way, Wabash National looks to be in much better shape than in years past and is worth putting on one's radar.